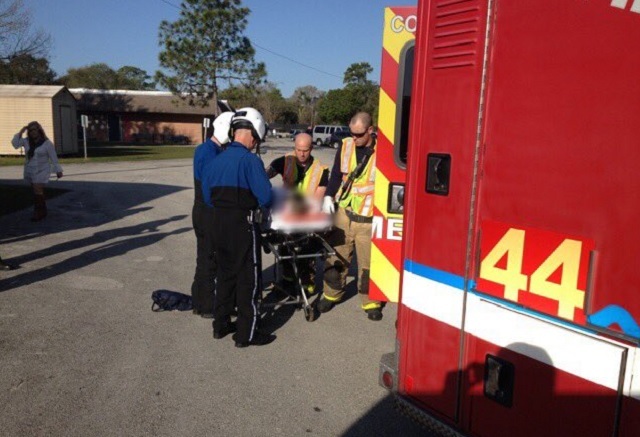 COCOA, Florida - A child has been airlifted to Arnold Palmer Children's Hospital after being run over by an S at Saturn Elementary in Cocoa, Florida on Tuesday morning. According to the Florida Highway Patrol, 42-year-old Myranda Lowry of Cocoa, Florida had driven a 2001 Isuzu SUV into the parking lot of Saturn Elementary School located at 880 North Range Road just before 8 a.m. to offload two children. Both children got out of the SUV - one from the front seat and one from the right rear seat. When the second child got out of the SUV, he fell to the ground. The first child closed the front, right door to help the second child get up. That's when Lowry thought both children were clear from the SUV and began to drive away. The right, rear tire of the SUV then ran over the first child's leg. 9-year-old Ray Jabbar was then airlifted to Arnold Palmer Children's Hospital in Orlando, Florida with minor injuries as a precaution.